Aluminum vs. Copper Gutters | Which is Right for Your Home? WHICH TYPE OF GUTTER IS RIGHT FOR YOUR HOME? WE CLEAN GUTTERS LLC has provided information on aluminum gutters and copper gutters below. 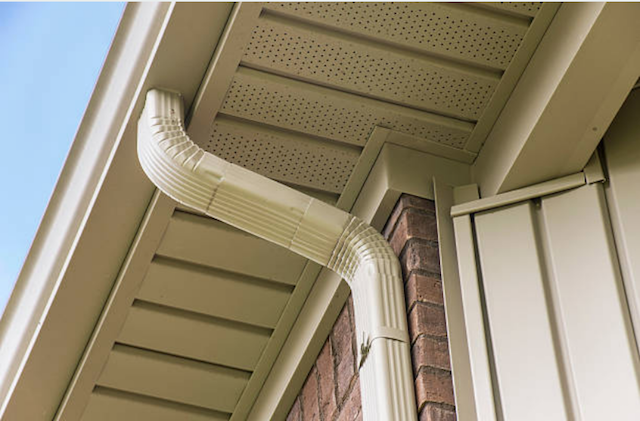 We offer both in our gutter installation service in our service area. Learn more about our service here. Gutters are available in various materials for home and building owners to choose the ones that are suitable for them and that do not interfere with the aesthetics of their property. The most common types of gutters are made from aluminum or copper. Most people are usually torn between the two. Both types of gutters are great, but there are differences. Having information about both aluminum and copper gutters will help you homeowners and property managers a determine which one is right for them. Most homeowners usually go for aluminum gutters because of the advantages associated with it. Aluminum gutters are more affordable compared to copper gutters. Although the prices vary from one contractor to another, there’s an estimate for the normal aluminum gutter system. You will pay between $3.50 and $7.00 for each linear foot. Therefore, the total cost will depend on the length of material you require. People with large homes usually choose aluminum gutters because it enables them to cover a considerate area at a lower cost. Studies show that only 20% of gutters in America are not of aluminum material. This is an indication of how popular they are. It is possible to paint aluminum to fit with your home theme or décor. White and brown are the most common colors for aluminum gutters. However, they are available in a variety of colors, about 25 of them. Therefore, you will be spoilt for choice and you cannot fail to get a color that adds beauty to your home. Some people prefer aluminum gutters because they are easy to install. All you need are some tools and parts, and you are good to go. Aluminum gutters are light which makes them easy to cut and mold. You can install aluminum gutter yourself. There are different techniques for installing aluminum gutters. For example, using screws, hidden brackets, or spikes that have ferrules. Strap hangers can also be used to get it on the roof sheathing. One drawback of using aluminum gutters is that they are less durable. The aluminum material is soft, and this makes it vulnerable to dents and corrosion. Therefore, you may have to spend money on maintenance many times. However, you shouldn’t lose hope with aluminum gutters because they are coated with enamel which helps them avoid or delay rusting. Aluminum gutters are widely available compared to the rest of the gutters. When you settle on aluminum gutters, you will not find them easily. Their thickness varies from between 0.018 in and 0.032 in. The thicker the aluminum gutter, the more ability it has to protect your home from snow, or falling tree branches. The standard aluminum gutter is sold in parts of 10 feet. If you need more, a sealant and slip joint connectors can be used to join different parts. Some roofs are not suitable for aluminum gutters. If you have algae-resistant shingles then you should not install an aluminum gutter. If your roof is already coated with copper, however thin it is, you cannot add aluminum gutter on it. If you are living in a region that experiences little rainfall or a lot of salt fog then you and you have shingles on your roof, some of the shingles will be left in the gutter. The result will be galvanic corrosion. Copper is heavy and therefore difficult to cut or make modifications. This means that you may not be able to install it yourself. You will spend more on installing copper compared to aluminum because of the extra effort and time it requires. Installation of copper gutters involves soldering together the different pieces. The pop riveting technique is also used during installation of copper gutters, and this involves using fasteners to join a gutter accessory to another one. Several items hold coppers in place, and examples include different types of brackets (hidden ones, exterior ones and so on). Copper is expensive. A linear foot of it will cost you anything between $18.50 and $26. When you consider the fact that you will not have to do repairs and maintenance every time and your property will increase in value, you will realize that copper gutters are not expensive in the long run. Copper gutters are more durable because they have a patina that protects the metal. Therefore, you will not have to worry about doing maintenance because the gutters rarely need that. Copper will maintain its appearance for a long time and will also function for long. Having a copper gutter will increase the overall value of your home and make it more marketable if you plan on selling it in future. 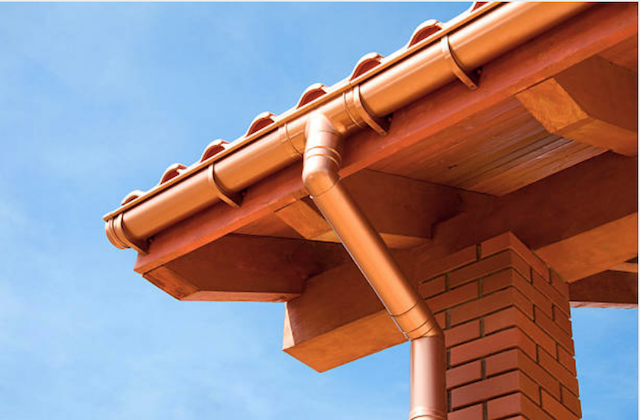 Copper gutters have a high resistant towards rust. However, they need to be cleaned and treated with a sealant to avoid tampering with this quality and keep the gutter looking shiny. The green patina that people like in copper gutters usually develops with time. When choosing attachments and fitments to be used on your copper gutters, be sure to get copper material too, and they should have the same kind of strength. Once you decide to go with copper gutters, you cannot mix it with another material. For example, if you get fasteners and attachments made of aluminum then what will happen is that the copper will become start to degrade. Copper is pleasing to the eye, and that is why some homeowners will buy regardless of how much money they will have to part with. Some people do not even know the benefits of copper gutters, all they know is that they make their homes look good and that is why they will settle on them. Some people fear to install copper gutters because of the possibility of attracting robbers who target precious metals. However, if your area is secure and if you take the necessary precautions, then you should be fine. Both aluminum and copper gutters have amazing qualities. Your choice will depend on what you are looking for. Be sure to follow proper ladder safety during installation or consider hiring a professional for the job.